Hello ladies! It is has been a lazy week for me. Lazy because I had problem with my files and couldn't fix it, so decided to be a couch potato and had a marathon of Turkish movies. Well, no more problem now that's why I am back to blogging. Now look at these sweets. I know I have to watch my diet but they are very much tempting! Hubby bought this the other day. This is one of Dunkin' Donuts newest premium donut.My daughter and I shared bites but we couldn't even finish it.If I remember it right, I think hubby said he paid P46 for this donut. 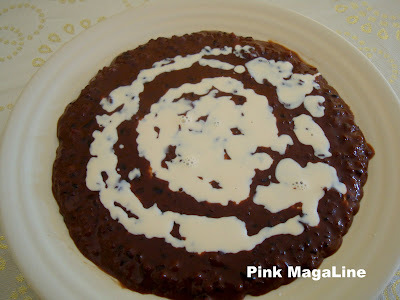 My yummy champorado or chocolate pudding with evaporated milk on top.I have to slowly finish the glutinous rice I got from the province,so I cooked this for breakfast. The little one loves this so much. 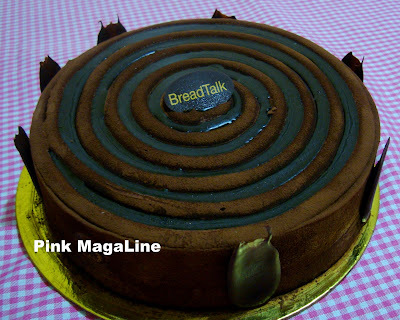 Then, hubby bought a cake BreadTalk AGAIN!This one's called chocolate passion.Like the Snowy Mountain cake, this cake also costs P600. Later today, I am gonna be attending a couple of parties. You know in parties, sweets are always present. Very bad 'cause I'm trying to have a slimmer figure for my early summer vacation this February. What should I do? Like is too short to deprive yourself of things that's keeping you feel in love.. chocolates!! Note: In moderation please. If you have a whole cake, slices it into small pieces and eat part by part. Have a sweet weekend everyone!!! Champorado!I've not had this for years! Hindi halata na chocolate lover kayo sis, hehehe! 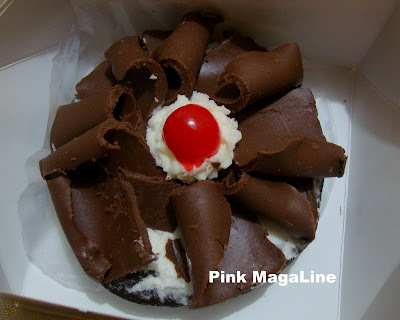 Masarap din naman talaga yung black forest donut of Dunkin' Donuts. :D Parang Black Forest cake talaga sa apearance and taste. Favorite ko yung chocolate shavings. Natry mo din po ba yung ibang premium donuts of Dunkin' Donuts? Masasarap din po. Sana matry mo din yung Blue berry cheese doughnut. I made a review about it here po >>> http://kaibril.com/blueberry-cheese-doughnut-dunkin-donuts/.